This course has presented the biology, mechanisms, outcomes, and therapies surrounding anxiety and fear. It's now time to reflect on what you've learned and take the necessary steps to rethink and cope with fear and anxiety in your own life. Anxiety and fear are complex and fascinating emotions that govern so many aspects of our lives, motivations, and futures. This course has given you ample evidence to think about and respect fear and anxiety from points of view you may have never considered. You now understand how these emotions manifest neurobiologically and the many positive experiences a healthy level of these emotions can bring. You also understand the ways these emotions may affect your health if you are not watchful and compassionate about exploring them, as well as many anxiety disorders that hundreds of millions of people around the world cope with every day. Lastly, you've learned an overview of the major therapeutic schools that help people deal with short- and long-term anxiety issues in their lives, and may even have begun establishing your own system of coping behaviors—mindfulness, exercise, and a robust social support network. It is our hope that this holistic look at fear and anxiety has given you more to think about and be grateful for in terms of these emotions. Often it's difficult to realize that these emotions are for our own benefit—some people never learn this and continually cast fear and anxiety as "the bad guys" in their lives. With just a little more awareness, however, these emotions can be seen as great allies for you your whole life through. They can certainly be taken too far and can cause body and heartaches in the lives of millions of people. But there are always ways, small, humble ways, to remind yourself that these qualities serve you and can be lived with and cherished in harmony. Where does this leave you now? If you are someone who rarely experiences bouts of intense fear or prolonged anxiety, the ideas and concepts we've covered have given you a wider appreciation for people who may not be so prepared to deal with them. You now also have a wealth of knowledge and resources to call upon if, in the future, an unexpected circumstance thrusts the worst of these emotions into your life, or if someone you know begins experiencing symptoms of fear, stress, and panic. You've become an empathetic guide for your own and others' anxious tendencies. Or maybe you're a person who has anxious and fearful tendencies. Learning about the predictable ways these emotions manifest themselves, and the physicolgical hoops they always make you jump through, will give you strength and courage to break their cycle in your life. Couple this awareness with potential therapies to try out and foundational behaviors to help you cope and you have all the tools you need to establish and practice your own "anxiety reducing" and "fear appreciation" habits. Lastly, if you are a person who is suffering from any of the debilitating anxiety disorders covered in this course, you now know that there are many different therapies available to help you return to a normal life—one where anxiety and fear don't predominate your thoughts or inhibit your behaviors. Remember: Anxiety and fear exist for your benefit. They have gotten the better of you for a while now, but they are part of a predictable cycle of chemical and psychological reactions. Medication and coping techniques can help you reclaim your sense of value and security. Coping plans and behavioral changes are possible. Through them, you can reacquaint yourself with the benefits of anxiety and fear, and lay the foundation for a better relationship with the fears and anxieties that may affect you more than other people. 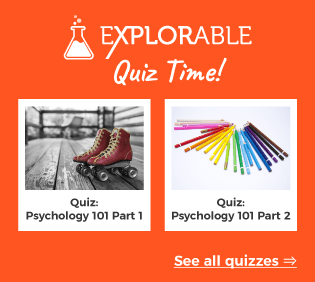 Thank you very much to all Explorable.com learners and readers out there. We hope you've learned the value of anxiety and fear in your life and that, if you need help coping with or understanding your own anxiety and fears, research and interventions exist to help you reestablish a healthy relationship with these vital, if misunderstood, emotions.